These cleaners rely on ultrasonic sound waves to create vibrations to produce millions of tiny bubbles that scrub the surface of the parts, reaching into grooves and tiny holes that are usually hard to clean. Ultrasonic parts cleaners are faster, automated, more consistent, and safer than other methods available, and they are considered a very successful means of removing soluble particulates. Ultrasonic parts cleaners have replaced traditional methods that used scrubbing with toxic and harsh solvents and they require little manual labor. They are also more environmentally-friendly than using chemical solvents or hazardous chemicals. The automotive, pharmaceutical, medical, beverage, electronics, marine, sports equipment, and weapons industries all use large capacity ultrasonic parts cleaners to clean products like hard drive components, small automotive parts and process machine components that have grease or lubricant build up. Smaller models exist for at-home use, which generally involves jewelry cleaning applications. Ultrasonic parts cleaners are capable of cleaning individual parts as well as multiple items simultaneously and are used in a variety of commercial and industrial applications. 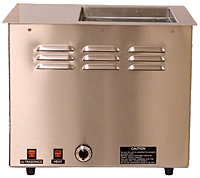 Components of ultrasonic parts cleaners include a cleaning tank of varying size, ultrasonic agitators, transducers, pumps or pressure generators, a metal cabinet that acts as the housing, nozzles, and a reclamation system. Most have some method of drying, which may be a heat gun or heating system as part of the machine. In order to ensure that every part’s surface, holes, and cavities are cleaned properly, many ultrasonic cleaning systems have rotating parts holders, tumbling baskets, or oscillating systems. During the cleaning process, the dirty parts are placed in baskets and immersed into the cleaning liquid which is usually around 110 degrees Fahrenheit though it varies depending on the material of the parts. Ultrasonic sound frequencies cause cavitation, which is the formation and implosion of millions of tiny bubbles in the liquid. When these bubbles implode, a scrubbing action to the product surfaces occurs, ridding them of contaminating substances. The frequency of the sound waves created is directly connected to the number of generated implosions, so the higher the frequency the more implosions are created. This allows for a high level of control in the cleaning process. The parts are then rinsed with water or a solvent and dried, leaving a clean product with no streaks or fingerprints. Ultrasonic Parts Cleaners Ultrasonic parts cleaners use high frequencies to clean, degrease, and sterilize a variety of parts that have come into contact with grease, dirt, wax, lubricants, oil, or other contaminants through the manufacturing process or during industrial use.